It official WordPress eCommerce is for every one now. I just finished up another Migrate Plugin. The new plugin allows users of Zencart to migrate to WordPress eCommerce with just a few clicks. To make things even better, this time around I added support for Order History. So what all can you do with the Zencart Migrate plugin? The Order History is new and very experimental. At this time it will not import subscriptions or download access from Zencart. If you need these things contact me directly and I’ll make them happen. Here are a few screen shots of that the interface looks like. As you see from the screen shot, it’s a lot like the osCommerce Migrate Plugin. The big difference is that zencart supports table prefixes. 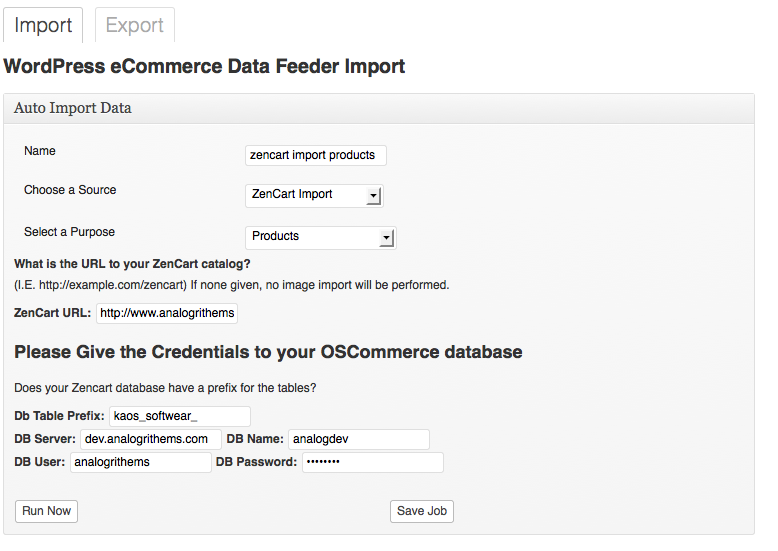 To use the Zencart Migrate plugin you need to first have the Ecommerce Feeder Plugin Installed. Then you need to install The Zencart Migrate Plugin. To install a plugin from a zip file login to your dashboard and got to Plugins -> Add New then select Upload from the top tabs. Select the zip file you just downloaded and click Install Now. Activate them both and then go to Tools -> Ecommerce Feeder for there you can put in your database credentials and select the data you wish to import. As always be sure to back up your WordPress Database before you run the import jobs. This is really important as you may run it multiple times as doing imports is trial and error processes right now. I hope you can help me! I can’t seem to find this Zen Cart Migration plugin on WordPress plugin pages and when I click on the link above It just downloads in onto my computer….am I missing something that I need to do to install this on WP? A few things, have a look at the page again, I’ve updated the links to download the plugins as the code has been updated. To install a plugin from a zip file login to your dashboard and got to Plugins -> Add New then select Upload from the top tabs. Select the zip file you just downloaded and click Install Now. I was wondering if this is a problem with the script in the file class.php? It seems like your PHP install doesn’t have PDO mysql installed currently.